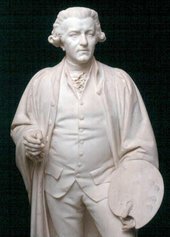 During his lifetime Joshua Reynolds was among the most celebrated artists in western Europe. He was a brilliant portraitist, impresario, a skilled networker and a master of spin. Through his paintings, his friendships and his manipulation of the media, Reynolds was – as this exhibition reveals – a driving force in the creation of a cult of celebrity which is so familiar today. This is Tate Britain's first ever exhibition dedicated to Joshua Reynolds. Rather than providing a general survey of Reynolds’s art, it focuses on a key aspect of his achievement, and sets it within the social, political and cultural context of the artist’s times. The exhibition brings together a selection of the greatest portraits by Reynolds, many of them depicting the most famous men and women of the eighteenth century, such as the writer Samuel Johnson, the actress Mrs Siddons, the political philosopher Edmund Burke and the actor David Garrick, as well as courtesans, aristocrats and military leaders. Collectively, they represent the cream of British society of the era. But Reynolds did not simply paint these individuals. He befriended them, brought them into contact with one another, shaped their public images, and massaged their egos. The highlight of this spectacular exhibition is undoubtedly Reynolds's celebrated portrait of Omai. 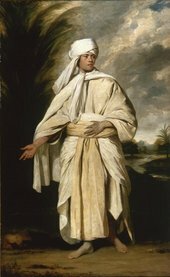 Omai was a young Polynesian man who came to England with Captain Cook and became a sensation in aristocratic and intellectual circles. Tate Britain is delighted to be able to display this rarely-seen painting, alongside many more of Reynolds’s masterpieces. Portrait of Omai to be shown in major Reynolds exhibition at Tate Britain: Press related to past exhibition.